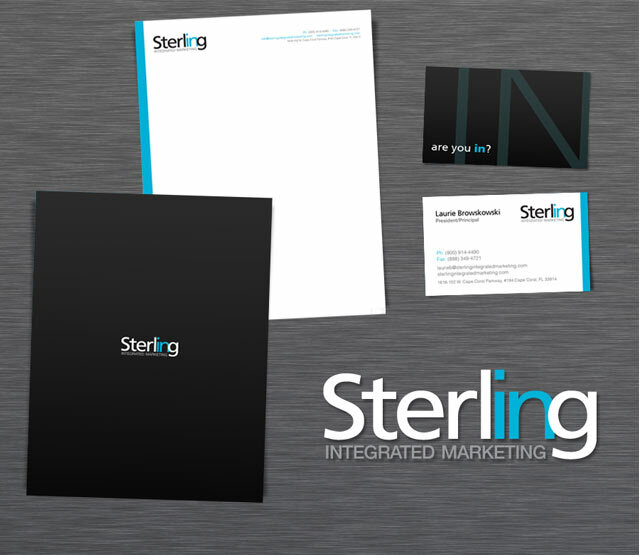 Earlier last week, we completed a full corporate identity and web development project for a full service marketing firm, “Sterling Integrated Marketing”. We began the project by developing the new identity for our new client and after a face-to-face meeting, we had our logo design brief. Our two lead designers, Brian Yerkes (Owner & Creative Director) and Colin Hughes (Designer) began with the concept development phase of the project. This stage of the logo design process includes hours of sketching and discussion between the Brian Joseph Studios team after learning about our client, their market, and their company goals. 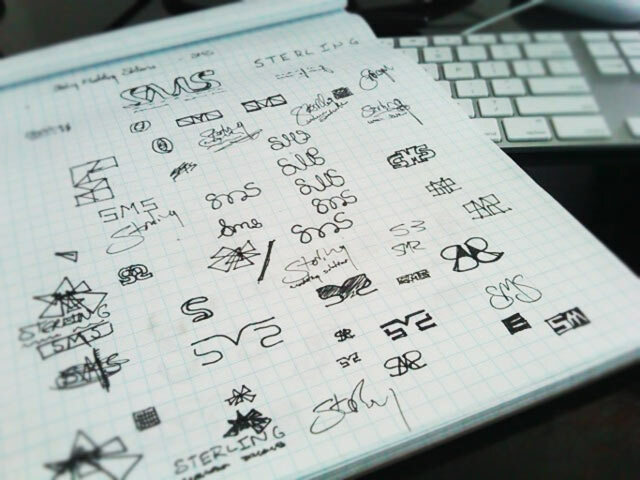 Below you will see just a few of the sketches we worked on as we were forming our concepts for this new identity. 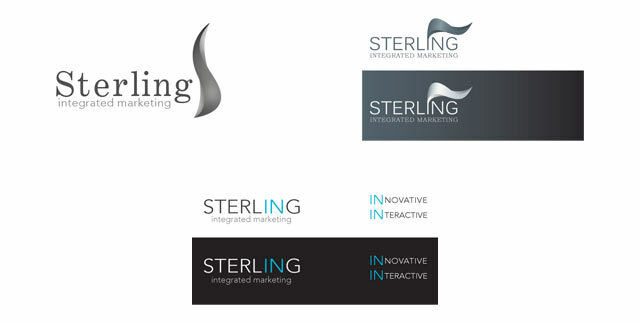 Originally, our client was going to use the name “Sterling Marketing Solutions”, but soon after changed it to “Sterling Integrated Marketing”. 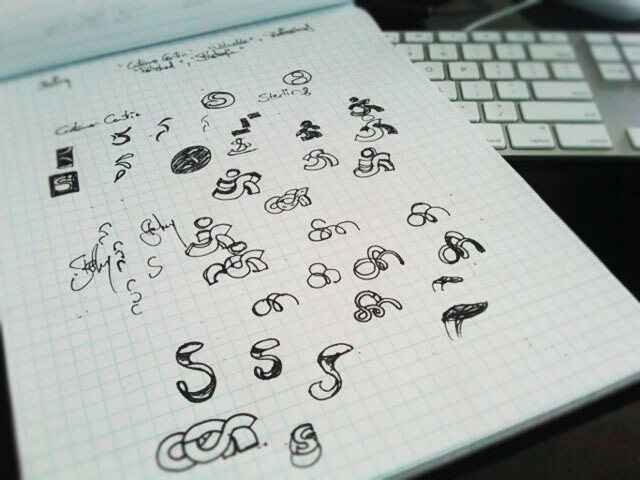 You can see some of our sketches were based on the earlier choice, but some of our work on developing an “S” shape carried over. After our sketching process, we met again to discuss the potential of each concept. There are many vital steps that we take before we choose to proceed with a specific concept. We talk about its flexibility, its versatility and ability to grow into a full brand for the client. When developing logo designs, it is important that the identity is easily viewed in small sizes, and when displayed in different applications, including black and white. Once we had a few strong concepts that we were happy with, and that matched the logo design brief from our discussions with the client, we then turned the sketches into digital drawings, and finally into finished logo designs for the client to review with us. We sent a full description about each concept to the client, explaining our inspiration sources and why we were confident that each concept matched their goals for their new identity. After reviewing each concept over the phone with the client, they decided on the design with the black lettering and light blue “IN”. This concept not only provided them with a logo, but also a full branding concept that could be carried over to each piece of collateral. After receiving our client’s feedback, we began developing the “IN” concept further and decided to integrate it more closely with the other letters…taking inspiration from the word “Integrated” in the company’s new name. After a few more revisions, the final concept was developed and ready to go. We also created some stationary designs as part of the project, with all pieces presenting the new “Are You In?” brand message that we developed. Once the identity project was complete, we moved onto the development of the website. 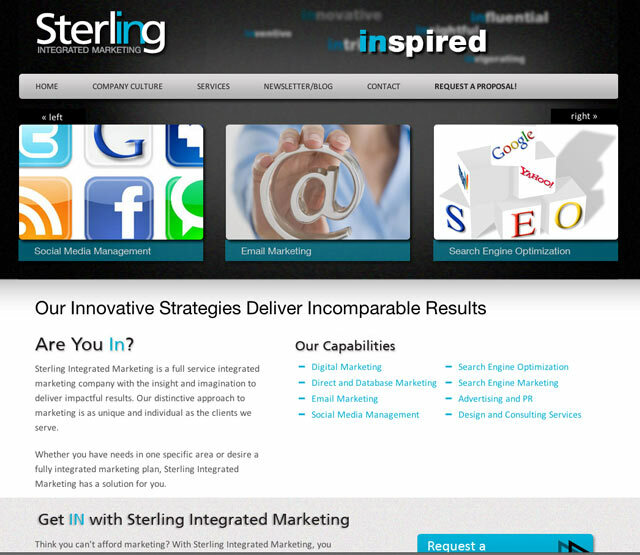 We designed a custom web design for Sterling Integrated Marketing, using the bold colors from the logo, and an easy to use interface for the viewer to navigate through. Information is presented in a concise manner, and is easily retrieved to ensure that the user experience is a positive one.